A few years ago, Pop Pop stepped away from making funeral arrangements for a few reasons, namely that at 87 he’s outlived and buried most of his contemporaries, an accomplishment that would make some feel lonely, but for him it feels like completion. 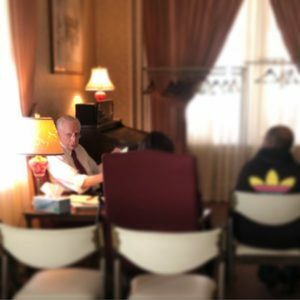 He was here for his friends and family when they needed him, and now that most of them are gone, he focuses on other things at the funeral home. Even now, every once in a while, someone Pop Pop grew up with will die, so he puts on suit and tie and takes charge of the funeral arrangements. Today was one of those days. A 91 year old friend of our family passed, and Pop Pop met with her family. I came down in the middle of the arrangements to grab some information (and snapped this photo in the process) so I could type an obituary draft for the family to read before they left. Pop Pop’s proud of me being in the business, as any family patriarch would be. When I entered the arrangement room to get the info, he started doing what grandfathers do when they’re proud of their grandson. There’s a number of things that make for a good life, and one of them is finding what you love, and somehow or another making it your profession. It’s rare that we do what we love, but when we do, it not only benefits us, it benefits everyone our work touches. Pop Pop’s love for the business and the people he serves has benefited those people just as much as it’s benefited my Pop Pop. He might be 87 years old, but when he’s working with his people, it’s like his 87 year old body momentarily drinks from the fountain of youth. That’s the magic you find when you do what you love. And that magic spills over to the people you love. 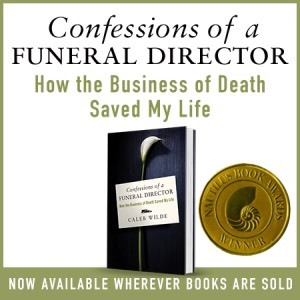 This entry was posted by Caleb Wilde on November 11, 2018 at 4:49 pm, and is filed under Funeral Directing. Follow any responses to this post through RSS 2.0.You can leave a response or trackback from your own site.